Finding the right barber can be a lifelong search — ask any man who’s had too much or not enough of his locks cavalierly lopped off and stepped out onto the street disaffected. Thankfully, there are experts in this area who excel in getting the discerning man’s ‘do’ just right. Here, some of Sydney’s best barbers are recommended. 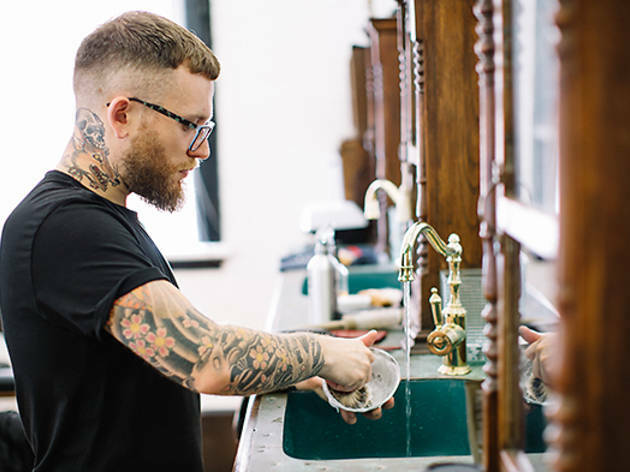 Owned by veteran barber Tony Vacher, Sterling Hairdressing Parlour & Barber Shop and Sterling Apothecary are two of Sydney’s greatest locations for men in search of the most classic of cuts. They have a particular knack for timeless, retro styles. 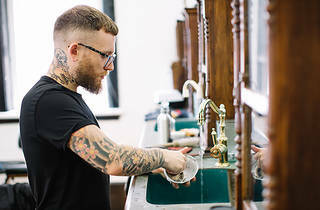 Sterling not only offer men’s haircuts, styling and colour, but also hot-towel cutthroat razor shaves and beard trims — the full continental barbershop experience. Plus, they stock all men’s grooming needs, from their in-house aftershave tonic to Badger hair shaving brushes and razors. As evidence of their traditional yet individualiszed approach to men’s grooming, Sterling has partnered with LYNX as part of the iconic men’s brand’s Expression Series. What more could you ask from a barbershop than a precise cut offered in the same space as an award-winning bar? The first thing one notices upon entering The Barbershop in the heart of Sydney’s CBD of an evening is the dimly lit European cocktail bar-style interior, and indeed they offer a variety of beverages to suit your tastes, from vintage gins to boutique-bottled beers to European wines. Their bar is so good, in fact, that their owner Mikey Enright won a Time Out Legend award in 2014. As one might imagine, they offer all the traditional barber services, alongside contemporary cuts.